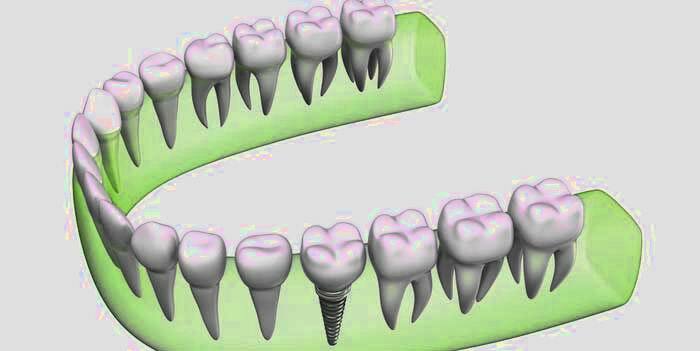 An implant is a titanium cylinder measuring between 8-16 mm long & 3-6mm wide. The implant is inserted into the jaw bone in place of the missing tooth root. 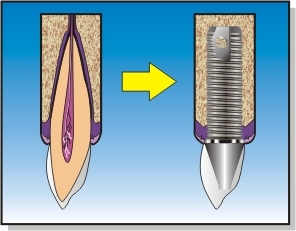 The bone then attaches itself to the implant, a process called osseo-intergration. Dental implants are used to replace lost or missing teeth. After the implant has been integrated it supports the new teeth. (inserting the rawl plug in the wall). In our clinic we prefer to use advanced Swiss & Israeli implants. A 16 year old girl genetically missing 2 front teeth. Problem solved by inserting 2 implants and 2 porcelain crowns. In the past the treatment would have been-the grinding down of 4 healthy teeth. bone resorption, as well as loose and painful dentures. The placement of 8 implants stabilized his new dentures. In the past- there was no solution. A 23 year old man missing 4 posterior teeth. He underwent 4 implants and progressed from a removable denture to a fixed bridge. A 40 year old male with no teeth. Implants in both jaws and full arch fixed bridges. 2 front teeth extracted 2 implants placed and loaded. 2 hour treatment.